I am all about living a vital, healthy high vibe life so I learn lots of tools to help with this and I felt inspired to share some of the basics. This was a year of great opportunity and growth in my music supervision career which also meant lots of deadlines and potential stress, anyone who works in the entertainment industry will def. know what I mean, well really anyone who works in a high stress job. This was a great opportunity for me to practice what I preach so I could stay healthy and sane :) There are a couple of practices that made a really big difference so I thought it useful to share. *Adding Healthforce Vitamineral Greens & Spirulina to my daily smoothie. *Having a green powder to make quickly when I didn't have time to make a smoothie. *If you only take one supplement, take your Omegas. These are essential for brain health and with brain disorders climbing rapidly it is very important. I take Krill Oil from Onnit. Just make sure you get a good source. Not all fish oils are equal. It really is not a luxury in this day and age with all our life stressors, but a priority to bring relaxation into your body. During the busy work week, I don't make social plans. I know that I will need all the extra time for either a massage, going to the Korean spa, acupuncture, working out or taking a bath. If you have a Float Tank near you, DO IT! What helps you deeply relax? Make it a weekly priority! Pro Tip: Make this activity a Friday night ritual to end your week right and give you energy to enjoy your weekend. I prefer going to a sound bath (if I am not already facilitating one :)) or getting a massage. If you live in LA, check out the $25 foot massage places. When anxiety is creeping in: Immediately stop to calm your nervous system with breathing patterns that have longer exhales. Keep breathing this way until you feel the anxiety subside. Take a few minutes before bed to plan your schedule for the following day so you can have peace of mind in the morning and not be on your phone for the 1st hour of the day. Sleep with your phone on airplane mode, do your morning routine, then check your phone. My day goes 100x better when I can do my morning routine which changes a lot, but usually includes some movement & meditation. Wim Hof Breathwork is one of the best ways you can start your day. *find an app or youtube with a meditation or workout practice if you need ideas. I need 8 hours minimum. Know what you need to function properly and do everything in your power to get those zzzzzs. Great time for podcasts or audio books! I am launching my own podcast this month Yeeeeee!!! Keep a lookout for "Vibrational Medicine with Ash"
Ok, that is enough for now. I hope you find some value in these. I'd love to hear from you if you do. Also, please share your life hacks with me! I am super interested in human optimization and always love learning more and sharing what I learn. Love to you this Holiday season! May this year be blessed with miracles and magic! "Sound energy therapy has not been widely studied, but there is some evidence that it can be beneficial for cancer patients because it promotes relaxation and reduces stress and anxiety". "There may be a new treatment, though, that actually uses sound energy in a powerful way to target and kill cancer cells. Medical researchers in the UK’s Institute of Cancer Research have been developing a treatment called high-intensity focused ultrasound, or HIFU. It involves using high-powered beams of ultrasound aimed at tumors to kill cancer cells. I recently was a guest lecturer at The University of Kansas speaking to college students who want to be pre-school to middle school teachers. I shared with them some breathwork exercises they can use in their classrooms. I have compiled a few of them below. For kids, combining breath with their imagination is the best way to go. It will help them with relaxing and managing emotions, as well as focus and concentration. These are practices that they can use for the rest of their lives to help keep them healthy. Place hands on stomach, imagine you are blowing up a balloon inside of your stomach. After a few breaths, make the balloon so big it moves up into your chest. Inhale through nose, exhale out mouth and make a sound. * Any breath with a longer exhale stimulates the parasympathetic nervous system which is relaxing and brings them into the present moment. 1. 3-5-7 - Put your hands on your ribs to feel the expansion in the lungs with the inhale. Breath in for 3, hold for 5, exhale for 7. 2. Breath of fire- Rapid, quick breaths focusing on the exhale. You can use the visualization of blowing out candles through the mouth or you can do this the traditional way inhaling and exhaling through the nose. The lovely comforting resonance of this has a calming effect and done with eyes closed can make it even more peaceful. Interlace the fingers underneath the chin. Inhale and lift the elbows up to frame the face. Exhale, lifting the head up making a whispered ‘hah’ sound towards the sky, like a dragon breathing fire. At the same time, lower the elbows back down to meet at the bottom again by the end of the ‘hah’ exhale. This breath technique builds strength and heat within so is a good energizer. What Is Happening On Our Planet?? This is a long one, but I had to write this down and share it. I have been in a deep state of reflection over the last few weeks since the Eclipse. We are living in turbulent times. There is catastrophic loss all over the world right now. In our country alone one coast is on fire and the other is flooding and bracing for record breaking Hurricanes. We are going through the greatest realignment as a country that has happened in my lifetime. That was predicted with the total Solar Eclipse traveling through our entire country. In astrology, eclipses are like a portal for exponential growth. Specifically, eclipses are a time of rapid change, either from internal or external circumstances. We are forced to face change in a way that might be uncomfortable, but that ultimately lead to maturity and since it traveled through our entire country it is affecting us on a collective level. This is reflected in our politics, extremists coming to the forefront, and now natural disasters forcing us to help each other. So, what do we do with this? First of all, and probably most importantly, reflect on how what is happening externally is a reflection of what is happening internally within each of us and reach out for support to shift your consciousness and the way you treat yourself. We are collectively on this journey of dismantling our unconscious beliefs that keep us better than, not good enough, on fire with unprocessed anger, drowning in depression and anxiety, afraid to share our voice, afraid of people who look different than us, believe there isn't enough for everyone, and so many other lies dramatically displaying themselves in our country right now. Reach out to people who you can relate to and ask for help. We are all in this together and there are more and more people available to support as the collective is waking up. You will be forced to change otherwise, you may as well choose to do the work with support and as much ease as possible. You are stronger than you think. Know that essentially you are God, Spirit, Love, whatever you want to call it and seek that eternal light within you. Understand that you are having a human experience and that you chose, along with everyone else you know, to take on some darkness to transform it and raise the consciousness of humanity at this time. That is why we are ALL here, we chose this...to participate in the evolution of consciousness. So have compassion with yourself, with each other as we are all learning and thank each other for going through this TOGETHER. Just as Buddha says "life is suffering". To be separated from Source is hard. We can make it a bit easier when we are connected to each other, to all life (plants, animals, Mother Nature) because we are all Source and it feels good. That is what we all want ultimately, connection! Ask, how can I create more connection in the world? Let grief cleanse your soul! Let the tears come. We are all connected so even if we are not directly affected by these natural disasters or tragedies happening on our planet we have access to feeling the grief filling so many. To add to that, we have inherited unprocessed grief from our ancestors. There have been so many generations of people who did not create the time (usually for survival) or know how to process the grief from genocides, displacements, etc. Some of us are more sensitive to that that than others and it is important to allow it to flow. There are very few places in our culture for the healthy expression of grief so we hold on to it and it creates so much dis-ease in our bodies. A teacher of mine explained tumors and "solidified sorrow". Grief is an ally. It opens our hearts and allows compassion to flood in. It gets us in touch with the vulnerable, sweet, parts of ourselves. We must allow ourselves to feel everything...just breathe through it. BE YOU! Be you so fully, so confidently, so freely and share your gifts NOWWWWW!! There is no time to wait. You are so needed. We all have our part to play! Show up my family!! May we all find the courage to show up fully and be the true example of what is means to be Human. May we all feel supported and loved. May we all know we are good enough and that we matter. May we all answer our hearts calling with action. May we all see the light in each other and encourage each other to shine brighter. What is Toning and Overtoning? Science has proven that the most healing instrument on our own bodies, is our own voice. It makes sense, right? We all have our own unique signature frequency and it would make sense that our own unique voice would have the most impact on our body. That is why it feels so good to sing. We can learn to use our own voice in various ways to bring healing within our emotional, mental, physical, and spiritual bodies. Overtoning has the most impact. This is when we learn how to make 2 pitches at the same time through positioning our mouth, tongue and throat in specific ways. One of the most popular forms of this is Tuvan throat singing from Mongolia. Watch the video below to understand the difference between toning and overtoning. Reach out to me if you want to learn more. Why Am I Not Manifesting What I Want? Have you done all the intending and visualizations and still not manifested what you desire? I have partook in many intention circles, created many vision boards, said numerous affirmations and still not attracted what I desired. Those are all valuable practices, but I think there was one very important piece that was missing. I recently discovered the work of Panache Desai which focuses on the ability to receive through clearing vibrational density. He talks about how if our vibrational body has density or blockages created from unexperienced emotions, we will not be able to receive what we are desiring. This makes a lot of sense to me. Since I have been doing his meditations I have definitely noticed a shift in my life. I am happier, attracting in beautiful experiences and people and have more energy. In combination with his guided meditations designed to "Ignite Boundless Receiving" through clearing all vibration density I have also been diligent with my breath and sound practices. These are vibrational medicines and a great tool to clear your energetic/spiritual body, which affects your physical and emotional bodies as well. It can be as simple as a few conscious deep breaths and 5 minutes of humming every day. As with anything, what you put in, you get out, so the more quality, intentional time you give to your practices, the more effects you will experience. If you are ready to start a daily practice to support you with feeling more peace, centered, connected, happy and attract in all you desire but don't know where to start please reach out to me. I love supporting people in implementing easy, life transforming practices into their lives. First, I want to share a bit about sound. Science has proven that everything is vibrating, everything is moving. Some things just move at a slower pace and appear to be dense or solid. We can measure vibrations by their “frequency” or how frequently they vibrate. This is measured in waves or cycles per second called hertz (Hz) which is the unit for frequency. Essentially, frequency, sound, energy, vibrations are different aspects of the same principle. So this means our body is vibrating as well. The parts that are more dense (teeth, bones) have a lower frequency than the organs and even lower than the liquids in our body like blood and water. All of this shows that our bodies are really symphonies of sound, however the frequencies exist outside of the range that our ears can hear. So if everything is vibrating that also means that our thoughts and emotions must have a frequency as well. The emotional body, for example vibrates at a much higher rate than the physical body, and the mental body is at an even higher rate than the emotional. This is not theory it has been proven by neuroscientists such as Dr. Candace Pert, Ph D. That could lead us down a whole other conversation about how our thoughts affect our bodies, but that is for another article. So how can we use this knowledge of sound vibration when it comes to healing. Well, we can discover frequencies that our bodies vibrate at in a healthy state and listen to those frequencies to create brain wave entrainment to bring us back to health. 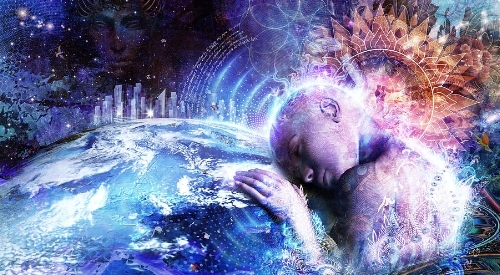 Using Binaural beats is another way of altering brain wave frequencies to induce particular states like a dreaming or meditative state to help with sleeping or meditating. We can also do this on a spiritual level. For example, certain singing bowls are tuned to frequencies of particular chakras and can be used to balance them. This also explains why certain frequencies or sound stimulate particular emotions in us. The frequencies that are in a song or sound resonate with particular emotions and can create them within us. So in that way, we can use music to change our emotional or mental state. Also, everyone has a unique vibrational signature that can be affected greatly by the use of their own voice. There have been all kinds of studies that conclude that the single most healing instrument a person can use is their own voice. This makes sense right? That is why singing feels so good and why music and sound are such important parts of almost every spiritual practice or religion. There are all kinds of different vocal exercises (toning) that can be used with different intentions to create optimal health. We naturally do this all the time through sighs, screams, crying, wailing, etc. It is our way of moving energy. We can take it to the next level by making sound with intention to support us in so many ways including relieving stress, inducing meditative states, clearing or balancing our chakras, building our immune system, regenerating energy, reducing body pain, taking back our voice/power, building confidence, stabilizing our emotions, building spiritual awareness, and releasing blockages in our energetic body. The field of sound therapy or sound healing is vast. The easiest way to get started is to use your own voice. My favorite way of doing this is through over-toning (see video on website), but there are many ways that are super easy and very effective. I love working with breath and sound because they are given to all of us at birth. We don’t need anything outside of ourselves. We can learn simple techniques that we can do at any time, any where, without paying anything…that is empowering!!! Start your day with a few minutes of humming with your eyes closed. Become present and notice where you can feel your body vibrating with the different pitches that you make. Visualize sending the sound into the areas of your body that hold tension or pain. Then open your mouth and continue to make sound, experimenting with different vowel sounds. Just stay present and feel into your body to notice how it affects you. Reach out to me if you have any questions or what to learn more. Check events page for upcoming classes. I do private one on ones if you are interested in learning sound practices to support you in your daily life. Breathwork and Sound Can Help! Anxiety is a common problem that people struggle with. I definitely have had my fair share of anxiety attacks in my life. It can be very detrimental to ones life if left unaddressed. At the root of anxiety is often fear, fear of failure, fear of not being good enough, etc. I encourage you to ask yourself questions as to what triggers your anxiety and what are you afraid of. For example, if you have anxiety about passing a test or showing your art at an exhibit ask yourself “what would it mean about me if I failed?” or “what would it mean about me if people don’t like my art”? Often there is a story of not enoughness or feeling unlovable below your anxiety. That is where the real work lies, to let go of those limiting beliefs that somehow your worth or lovability is in any way attached to an external circumstance. When you are feeling anxious there are things you can do to relieve the symptoms through your breath and sound. I made a short video to give you a few exercises. Conscious breathing is really the most powerful, instant acting tool to use in the moment when feeling stress and anxiety. Watch the video and share if you feel it is useful!